This one is a bit out of focus when you enlarge it, but I decided to post it anyway because the warmth of her smile is so disarming. At first I thought she might be wearing some sort of national costume, like something Tyrolean, for instance. 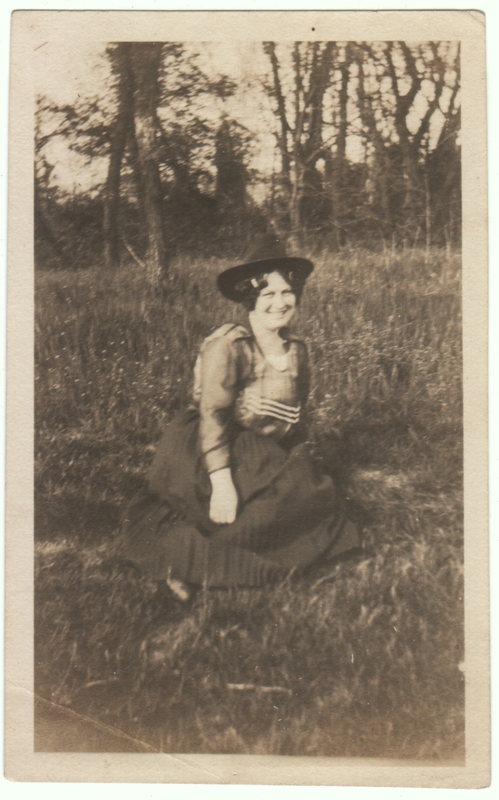 But when I enlarged it, I thought it looked like she was just wearing a normal outfit with a man’s hat. Perhaps the photographer’s hat? I could be completely wrong. And it doesn’t explain what looks to my modern eyes like hair rollers. But if this is an occasion where she and some guy are down in the grass swapping clothing, then no wonder her smile is so bright. It almost makes me feel a little naughty to be peering in on them. I agree. She looks so happy. Does she have a kitten or puppy poking out of her bodice? The…um…lumpiness of her torso region is not typical bodice lumpiness. I don’t know if that white at the neckline is animal, vegetable or mineral, nor if I’m insulting the poor dear by questioning her bodice. But. Do you see what I see? I’m not entirely convinced she’s alone under that skirt, either.